Consisting of 16 basic aphorisms or Sutras, Vedic Mathematics is a system of Maths which prevailed in ancient India. Composed by Bharati Krishna Thirtha, these 16 sutras help one to do faster maths. "Whatever the extent of its deficiency, lessen it still further to that very extent; and also set up the square (of that deficiency)"
On the right hand put deficiency^2, which is 1^2. Hence the square of nine is 81. For numbers above 10, instead of looking at the deficit we look at the surplus. (Poornavada ) in Philosophia Indica. Europeans triumphed with Indian knowledge ! some quotations from maths geniuses about the long forgotten Indian Maths ! without which no worthwhile scientific discovery could have been made." men of antiquity, Archimedes and Apollonius." This quoted text specifies another formula for the computation of the circumference c of a circle having diameter d. This is as follows. This is obtained by substituting z = Pi/ 6 in the power series expansion for arctan (z). This is Madhava's formula for Pi, and this was discovered in the West by Gregory and Liebniz. Madhava's cosine series is stated in verses 2.442 and 2.443 in Yukti-dipika commentary (Tantrasamgraha-vyakhya) by Sankara Variar. A translation of the verses follows. Multiply the square of the arc by the unit (i.e. the radius) and take the result of repeating that (any number of times). Divide (each of the above numerators) by the square of the successive even numbers decreased by that number and multiplied by the square of the radius. But the first term is (now)(the one which is) divided by twice the radius. Place the successive results so obtained one below the other and subtract each from the one above. These together give the śara as collected together in the verse beginning with stena, stri, etc. 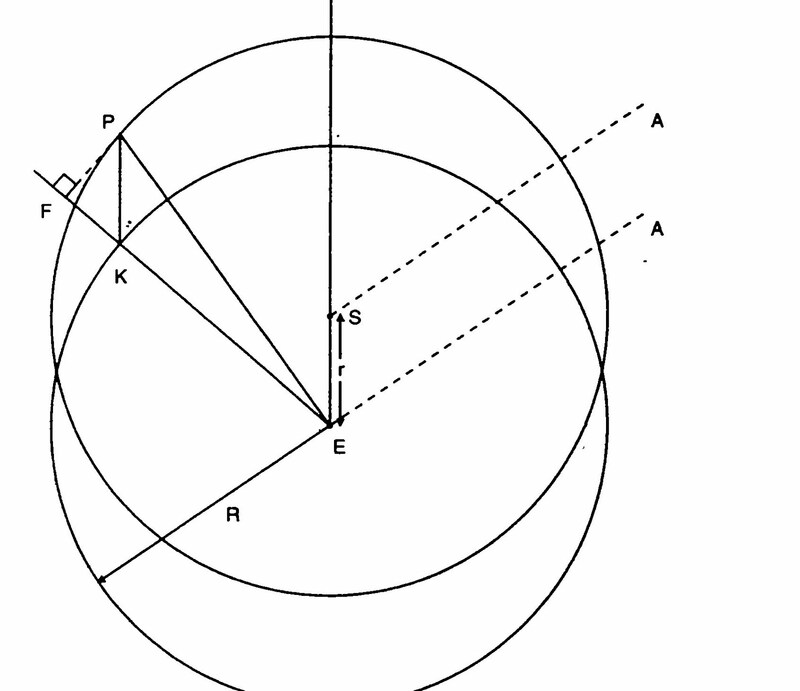 Let r denote the radius of the circle and s the arc-length. These are then divided by quantities specified in the verse. which gives the infinite power series of the cosine function. The Madhava Trignometric series is one one of a series in a collection of infinite series expressions discovered by Madhava of Sangramagrama ( 1350-1425 ACE ), the founder of the Kerala School of Astronomy and Mathematics. These are the infinite series expansions of the Sine, Cosine and the ArcTangent functions and Pi. The power series expansions of sine and cosine functions are called the Madhava sine series and the Madhava cosine series. The power series expansion of the arctangent function is called the Madhava- Gregory series. The power series are collectively called as Madhava Taylor series. The formula for Pi is called the Madhava Newton series. Multiply the arc by the square of the arc, and take the result of repeating that (any number of times). Divide (each of the above numerators) by the squares of the successive even numbers increased by that number and multiplied by the square of the radius. Place the arc and the successive results so obtained one below the other, and subtract each from the one above. These together give the jiva, as collected together in the verse beginning with "vidvan" etc. If x is the angle subtended by the arc s at the center of the Circle, then s = rx and jiva = r sin x. Sin x = x - x^3/3! + x^5/5! - x^7/7!...., which is the infinite power series of the sine function. By courtesy www.wikipedia.org and we thank Wikipedia for publishing this on their site. 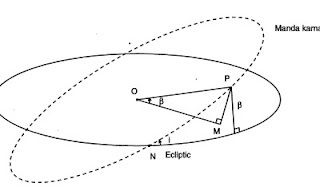 Jyeshtadeva was a Kerala astronomer who helped in the calculation of longitudes, when there is latitudinal deflection. 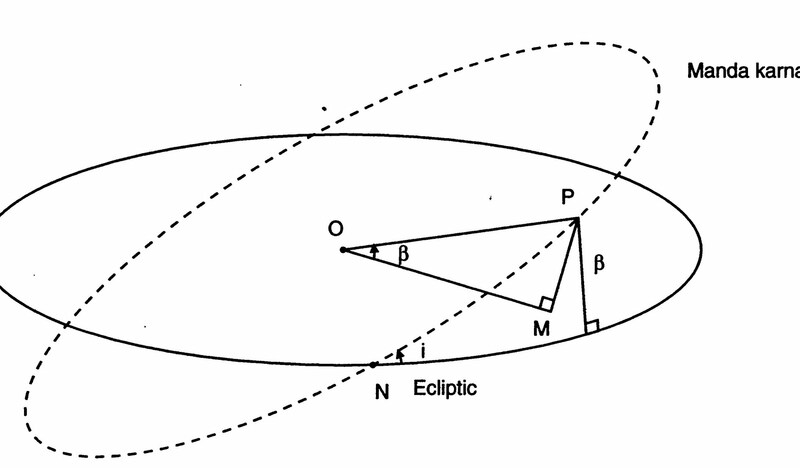 In his Yukti Bhasa, he calculates correctly the cos l, the cosine of latitude, which is important in the Reduction to the Ecliptic. There is a separate section in the Yukti Bhasa, which deals with the effects of the inclination of a planet's orbit on its latitude. He describes how to find the true longitude of a planet, Sheegra Sphutam, when there is latitudinal deflection. "Now calculate the Vikshepa Koti, cos l, by subtracting the square of the Vikshepa from the square of the Manda Karna Vyasardha and calculating the root of the difference." Taking this Vikshepa Koti and assuming it to be the Manda Karna, sheegra sphuta, the true longitude, has to be calculated as before. l, Vikshepa, is the Celestial Latitude, the latitude of the planet, the angular distance of the planet from the Ecliptic. i is the inclination, inclinent of Orbit. Sin l = Sin i Sin( Heliocentric Long - Long of Node ). Celestial Latitude is calculated from this equation. The longitude of the Ascending Node, pata, is minussed from the heliocentric longitude and this angle is called Vipata Kendra. 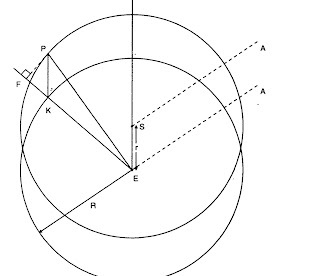 In the last post we said that Angle AES is Sheegroccha, which is the longitude of the Sun. ( Sheegrocham Sarvesham Ravir Bhavathi ). The Angle AEK is the Heliocentric longitude of the planet. Sidereal Periods of superior Planets in the Geocentric = Sidereal periods in the Heliocentric. Heliocentric Longitude - Longitude of Sun = The Anomaly of Conjunction ( Sheegra Kendra ). As Astronomy is Universal, we are indebted to these savants who made astro calculation possible. Even the word " genius " is an understatement of their brilliant IQ ! which is the Sheegra correction formula given by the Indian astronomers to calculate the geocentric position of the planet. Aslesha Njattuvela brings rains ! It was Monsoon Tourism, as Aslesha Njattuvela was on. It was raining heavily, cats and dogs in Kerala. I got the rains when I reached Kochi. I had some work at the Passport Office and I finished the work at Noon. Then I went on a tour of the famous Goshree Islands. I went by boat yesterday to the beautiful Bolgatty Island. A two minutes walk saw me entering the lovely Bolgatty Palace, a resort by the Kerala Tourism Development Corporation. I walked to the Bolgatty Bus Stand and took a bus to Vallarpadam International Container Terminal. Now everything is in place and one ship, OEL Dubai, was unloading. The progress of the ICTT is slow, but steady. The Bolgatty Palace is beautiful and well situated in the Mulavukad Island. This island is connected to Vallarpadam by a bridge. Vallarpadam is in turn connected to Vypin by a bridge. In fact these bridges are known as Goshree Bridges, as these beateous islands are known as Goshree Islands. In Vypin, one can see the GAIL LNG terminals, which adorn Puthuvypin. A new bridge, parallel to the existing Vallarpadam bridge, is being built to ease the traffic. I saw a barge jetty at Bolgatty and a barge carrying containers there. Kochi is a cauldron of world cultures. A versatile land where visitors from abroad, right from Arabs and Phoenicians to the Chinese, Italians, Portugese, Dutch and British have left indelible marks. A great Port, universally known as the Queen of the Arabian Sea. The newly renovated Bolgatty Palace has 4 palace suits, 6 waterfront cottages, 16 well maintained rooms and one can enjoy four star faciliites and a range of leisure options. Said a honeymooner, Asmita, Calcullat about Bolgatty " We went to Kerala for our honeymoon and Kochi was our first stop. We reached the resort at around 3:30pm after a long flight and were famished. Since we reached post lunch timings none of the restaurants were open, however the room service was very prompt and we had an amazing keralite food. The rooms are large, and built in a princely way. The property is equipped with all the modern facilities and the stay was really comfortable. We enjoyed the Kerala body message in the resort . The location is also great. Overall its a great place to stay ". 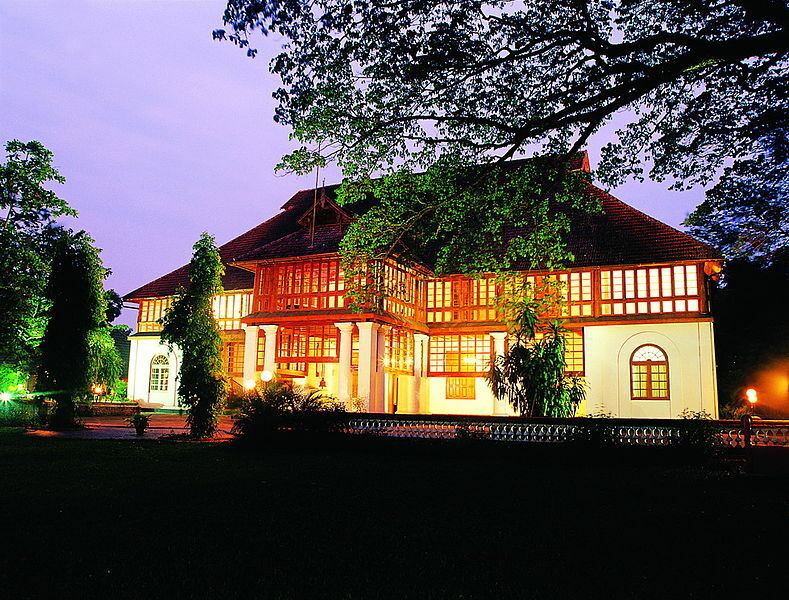 The Bolgatty Palace was built in 1744 by the Dutch and is a short boat ride away from the Ernakulam Mainland. 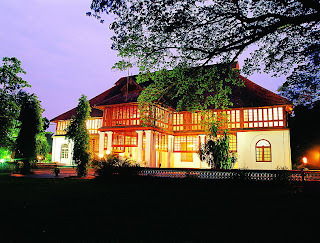 This is one of the oldest Dutch Palaces outside Holland the only Palace Hotel of its kind in Kerala. Now she has a Palace block and a resort block, called Bolgatty Island Resort. Amenities here comprise Swimming Pool, 9 hole Golf Course and is a destination of choice for select Indian corporates for their conference. It is a favourite destination for Indian elite and overseas tourists. The Kochi Airport is just 32 kms away and the rail and bus terminals just 2 km away. Kochi International Marina is a KTDC venture located on the eastern coast of Bolgatty Island in the Bolgatty Palace Heritage Hotel. It is the first full fledged marina of international standards in Bharat. It provides berthing facilities to 37 yachts and also offers services like electricity, water and fuel for boats. It is close to the international sea route at the South West Coast of peninsular India , with minimum tidal variations and favorable conditions. The Bolgatty Event Center overlooks the backwaters of Cochin Seaport and is an exotic venue for conducting Conferences, Exhitions, Wedding Receptions, Conventions and theme dinners. Imbued with resplendent greenery, the Arabian Sea and the ICTT at Vallarpadam gives an easy access to the Center.